So, I started a new position as a Linux Admin back in August of last year. The company is a fortune 100 and the job is fantastic. The only down side is it literally consumes more time than I have available. By this I mean we are currently working on such a wide spectrum of technologies that it's hard to give attention to anything else. That spectrum I mentioned spans from Openstack / vSphere Admin'ing to international remote site infrastructure installations. There's a lot to do. Which keeps me busy and happy. The single caveat is that my available attention to things like certs has been greatly diminished. I had to drop last terms Sec+ and VCP classes as I just couldn't keep up with the ramp up from the new job and class work. Needless to say the blog was set to the side and only lately have I begun to surface. However my current focus is spread a bit thin. 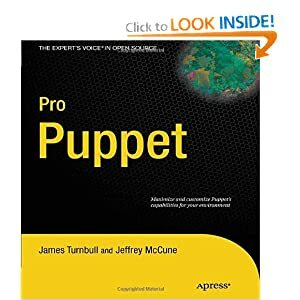 I'm looking over widely distributed directory deployments, working on the Python Scripting Expert class, and reading Pro Puppet. Things seem to move very fast in the company and if I'm not involved and actively working on the technology of interest the project moves on without me. Puppet is a good example of this. We are in a slow migration from CF Engine to Puppet, but if I don't jump in on configs, then the task will get picked up by another Admin. I loose out on the experience and knowledge. On the other side, I've got a full plate with Perl scripts, vSphere work, PM work for a Nagios deployment, Nagios reporting research, puppet manifests to write, plus more. Never a dull moment! So, for the next while I'll be doing my best to drop my usual random notes and articles, but please bare with me. The timing may be more elongated between posts as I'm running fairly short on that these days. Be well, grab your towel, and don't panic!